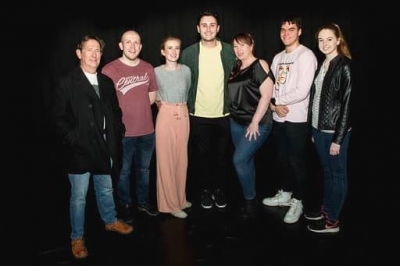 Nantwich Players scooped top prize in the festival for one-act plays for the Cheshire area of the All England Theatre Festival. The competition was help at the Nantwich Players Theatre over the weekend of 30th and 31st March which saw 6 entrants from 5 different societies. Prizes were handed out by Ian Clarke, National Chairman of the All England Theatre Festival and playwright Gail Young. Best Actress went to Bethany Froud from Nantwich Players for her performance of Marianne in Edgar & Annabel. Best Actor went to Harry Johnson for his performance of Nick in Edgar & Annabel. Best Director was won by Bev Clark for Before The Sun Goes Dark. Best original play was awarded to Before The Sun Goes Dark. The Adjudicator’s Award went to the cast of Stone Play. Best Production went to Nantwich Players for Edgar & Annabel. The Players will now go forward to the semi-final of the All England Theatre Festival next month. Nominations were also recieved by the Nantwich Players for Albert: Danny Froud (Best Actor), Fanny Weiss (Best Actress) and the set for Edgar & Annabel (Adjudicator’s Award).